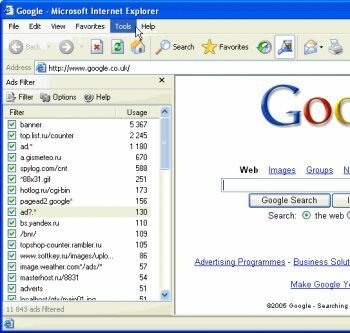 Ads Filter is a powerful content filter designed for MS Internet Explorer. It allows user to block unwanted adverts and other annoying content while browsing with IE. It prevents downloading of tons of ads and saves your Internet traffic and improves the page load time. The program keeps pages always clean, small and more informative. It can shrink wasted space used by banners - so, you will have more space for really useful information with less scrolling. It works silently and transparently. No additional setting is needed. Well, IE is quite usable now. Clean , light ad blocking filter for IE (like Adblock for Firefox) which many said can't be made. Excellent peice of software. Full points ofr such an excellent work. The only flaw, when putting an ad into the blacklist, Ads Filter doesn't remove it immediately and have to refresh. But generally, a good program that can rival THAT Firefox extension. Awsume! Even removes popup ad & banner ads from paltalk! I have already given the link to several people that are still IE fans. It's almost as nice as Adblock. Really close. Thanks, and keep up the good work. Its about time someone made a freeware Ad blocker for IE that uses no resources and does it job well. Very smooth here and yes..very similar to the Firefox extension AdBlocker. Working great here.Love how it takes out the space that the ad was using- much like adblock for firefox. Great when i use the IE browser. Does exactly what it says. Unobtrusive and efficient. Nicely done!